Myself and Darren hit the river for the last hour of daylight and the first couple of hours of dark, and it wasn't looking good. Just one missed bite to me and we'd just conceded defeat when Darren's rod knocked round. It only takes a second to make a winter trip! 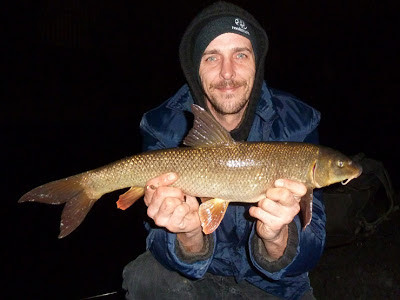 A 3lb 10oz barbel on a winter evening, great stuff! Cheers Jimmy. Any fish is a great fish at this time of year (in these conditions). Hopefully we'll catch a break, if not we will have to head for a lake. Between the three of us it's been 81 barbel - 5 pike!